My Hopeful Thoughts and Notably Ornate sets had arrived and I was itching to have a go at the beautiful frame in the Notably Ornate set chiefly... but you know how things happen when you start crafting! I fell utterly in love with the Hopeful Thoughts set and had made a complete set of cards with it before I looked up and realised that I was supposed to be carrying out all sorts of other duties! The bird from the Notably Ornate set is also going to be a prime favourite with me - as I knew he would. I love this ribbon treatment which turned out to be so easy with the 3/8" taffeta ribbon and a few touches of snail. I love the way it turned out - so pretty and feminine, and the adhesive backed pearl added just the right finishing touch. Cut a piece of Crumb Cake card stock 8cm x 21cm, score and fold into a card blank. Cut a piece of Whisper White card stock 7cm square. Colour the branch stamp with markers and stamp onto the square. Add centres to the flowers with a white gel pen. Use markers to colour the centre of the sentiment and stamp it onto the square using a stamp-a-majig for position. Mount the square onto a 7.5cm square of Old Olive card stock and attach to the card front. Stamp the bird onto a scap of Whisper White card stock using Early Espresso ink. Cut it out with paper snips and adhere to the card with a couple of dimensionals. Add an eye with a white gel pen. Pleat some taffeta ribbon, using Snail to secure each fold. Fix to the card and finish with an adhesive backed pearl. 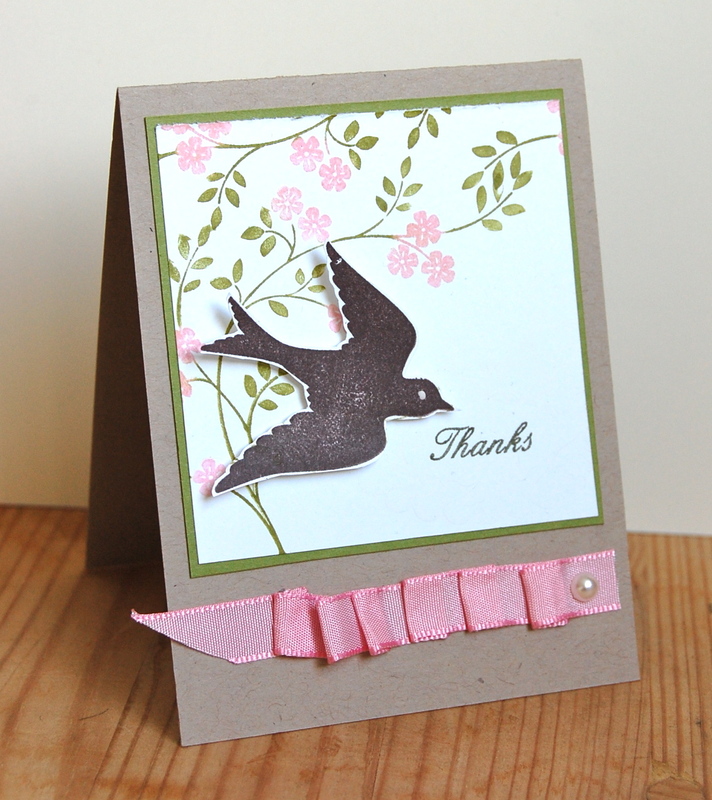 Touches of ribbon like the pink taffeta on this card can really add something special to your cards. I've put together some special packs of ribbon so that you don't have to spend a fortune on that je ne sais quoi! Click here to find out more. Hope you all have great weekends lined up. I have a date to watch Star Wars with my sons and a super fun crafting event to go to on Sunday - I'll tell you all about it on Monday! (The crafting event that is, not Star Wars!) See you then! So very pretty and LOVE what you've done with the ribbon! Hi Vicky - it's another really lovely card. I love the way you've done the ribbon. Absolutely gorgeous! I love the colours and layout.